When the execution order is received, the condemned inmate is moved into a special security area of the prison. Based on hourly checks, staff document his/her behavior and bring anything unusual to the warden's attention. The inmate receives priority visiting privileges; no visitors are turned away without authorization of the warden. Every effort is made to accommodate visits by the inmate's attorney including weekend or holiday visits if necessary. Psychiatric report - Results and interpretation of examinations, interviews and history of the inmate by three psychiatrists which will be used to determine the inmate's sanity. Chaplain report - Comments on the inmate's spiritual and emotional well-being. Summary of behavior - Observations noted by case worker and custody staff. Cover letter from warden - Includes firsthand information from interviews, observations or communication with the inmate and his/her family or friends. During the day before the execution, the warden will make special arrangements for visits by approved family members, spiritual advisors, and friends. About 6 p.m. the day before the execution, the inmate will be moved to the death watch cell which is adjacent to the execution chamber. From then on, a three-member staff unit will provide a constant death watch. Soon after he is rehoused, the inmate will be served his last dinner meal. The prison makes every effort to provide the meal requested by the inmate. Between 7 and 10 p.m., the inmate may be visited by the assigned state chaplain and the warden. The inmate may read, watch television, or play the radio. He can request special food items and coffee or soft drinks. The family, spiritual advisors and friends the inmate has selected as witnesses may arrive up to two hours before the scheduled execution. About 30 minutes before the scheduled execution, the inmate is given a new pair of denim trousers and blue work shirt to wear. 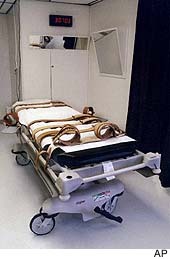 He is escorted into the execution chamber a few minutes before the appointed time and is strapped onto a table. The inmate is connected to a cardiac monitor which is connected to a printer outside the execution chamber. An IV is started in two usable veins and a flow of normal saline solution is administered at a slow rate. (One line is held in reserve in case of a blockage or malfunction in the other.) The door is closed. The warden issues the execution order. Each chemical is lethal in the amounts administered. At the warden's signal, sodium pentothal is administered, then the line is flushed with sterile normal saline solution. This is followed by pancuronium bromide, a saline flush, and finally, potassium chloride. As required by law, a physician is present to declare when death occurs. After all witnesses have left, the body is removed. Typically, the family claims the body. If not, the State makes the arrangements. Witness area—Entered via a door to the outside, the witness area has a view of the chamber through five windows. Execution chamber—An octagonal vacuum chamber, approximately 7-1/2 feet in diameter. It is entered through a large oval door at the rear of the chamber. Anteroom—Contains three telephones. One is kept open for use by the Governor; the other is for use by the State Supreme Court and Attorney General's Office; the third is connected to the Warden's office. The lethal injections are administered from the anteroom. The area also includes the valves and immersion lever used for executions by lethal gas. Chemical room—Includes storage cabinets and a work bench, plus the chemical mixing pots, pipes and valves used for executions by lethal gas. Two holding cells—Each contains a toilet and room for a mattress.